Hybrid design increases both dissolved oxygen levels and generates ultrafine bubbles. Optimized control suppresses the rise in temperature and reducing power consumption. Improve performance of plant factories, urban farming or city farming operations. Larger units available for horticulture greenhouse companies. Suitable for aeration of RAS and fish-tanks (Recirculating aquaculture system). agriGaLF requires a compressor or for better results an oxygen concentrator. The agriGaLF uses a hybrid technology for optimization of dissolved oxygen and ultrafine bubble production. High dissolved oxygen levels in irrigation water accelerates the growth of plant roots and activates micro-organisms in the rootzone. The agriGaLF is available in various sizes, the smallest unit is 1.5 m3/h, 6 m3/h and the largest is 12 m3/h. There is an option to buy the agriGaLF pumpless, in this case the user needs to add the pump locally. The best way to operate the agriGaLF is to recirculate the water in the day storage tank, it's not recommended to use the agriGaLF inline with the dosing unit. 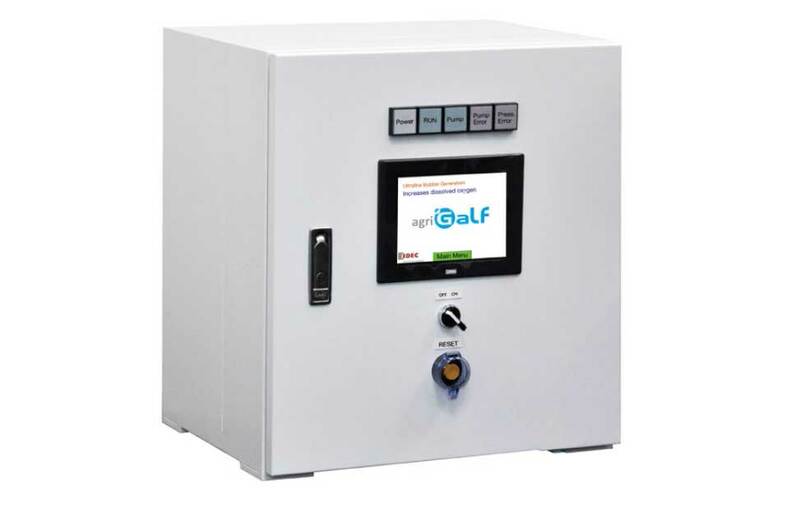 The agriGaLF is equipped with a PLC for standalone operation but the PLC can be easily connected to any climate computer in a greenhouse. The agriGaLF works best in combination with an oxygen concentrator. Alternatively, a compressor can be used to provide gas to the unit. A compressor supplies a little less than 20% oxygen while an oxygen concentrator supplies 95% oxygen. This makes the unit 5 times more efficient. From an electricity usage point of view its more economical to run the unit on an oxygen concentrator. The smaller agriGaLF units have a compressor on board the larger units need to have the compressor added locally when opting for a compressor instead of an oxygen concentrator. Gas remark Gas intake time 10 seconds / 2 minutes. 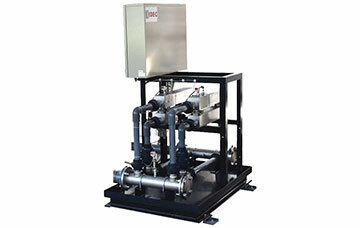 Water inlet 25A ~ 1"
Gas remark Gas intake time 3 seconds / 2 minutes.